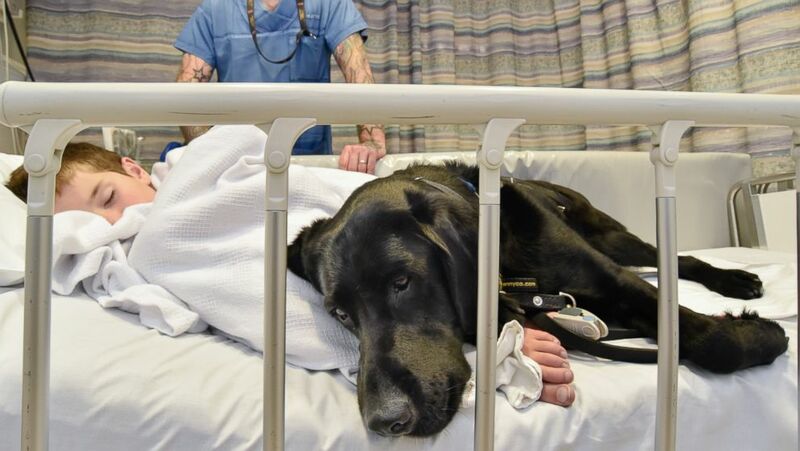 The dog refused to leave 9-year-old James Isaac's side as he got anesthesia. 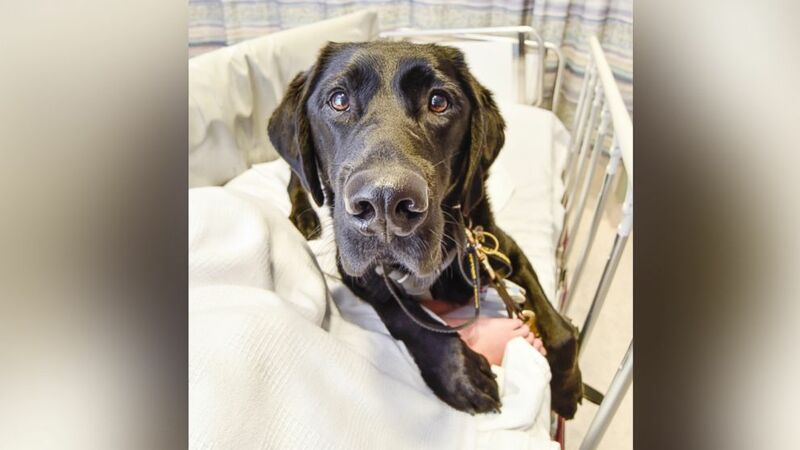 camera (Louise Goossens/Capital and Coast District Health Board ) Mahe, an assistance dog, accompanied 9-year-old James Isaac at Wellington Children's Hospital in New Zealand, where he underwent an MRI scan to diagnose the cause of his seizures. 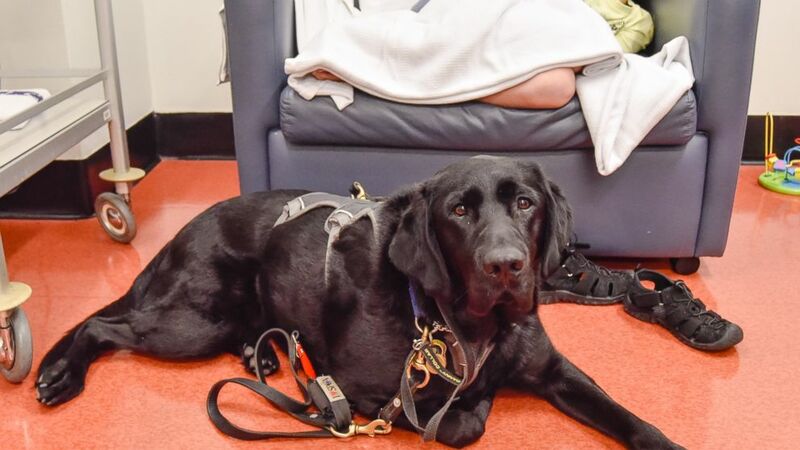 Meet Mahe, a professionally trained assistance dog who's completely changed the life of a 9-year-old boy with autism from Wellington, New Zealand. Where James Isaac goes, his trusty black Labrador always follows, according to James' mother, Michelle Isaac. Though James cannot speak and generally doesn't like being touched or making eye contact with other people, he happily will cuddle up with the 3-year-old dog, Isaac told ABC News today. 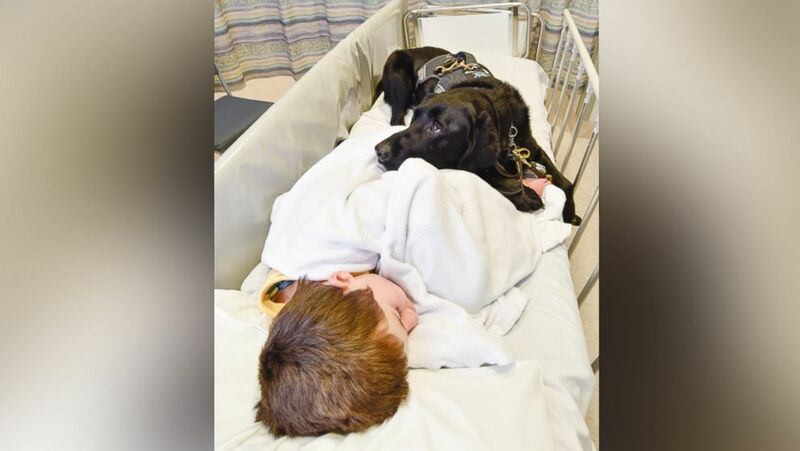 The inseparable duo have recently won thousands of fans on the Internet, after photos of the dog refusing to leave the 9-year-old's side at a hospital went viral. James went to the Wellington Children's Hospital on Feb. 9 to undergo an MRI scan to possibly figure out the cause of his recent unexplained seizures. 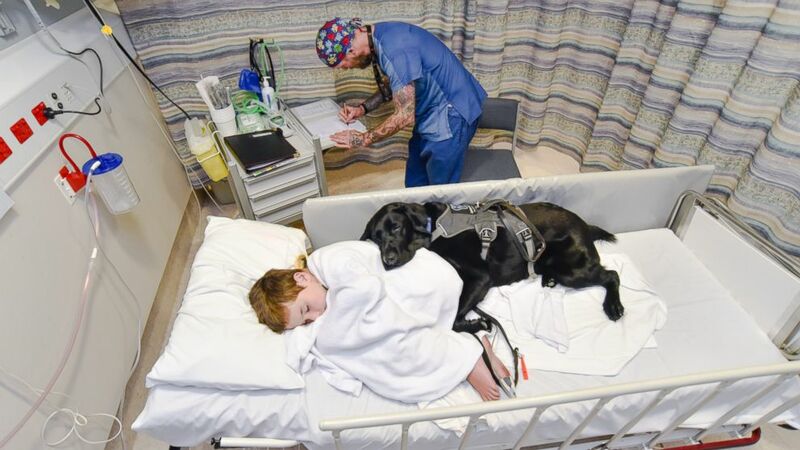 (Louise Goossens/Capital and Coast District Health Board ) Mahe, an assistance dog, accompanied 9-year-old James Isaac at Wellington Children's Hospital in New Zealand, where he underwent an MRI scan to diagnose the cause of his seizures. "The staff at the hospital were amazing and encouraged Mahe to hop on the bed with James to help keep him calm," Isaac explained. "As James was receiving anesthesia, Mahe put his nose right up to James' face and seemed really concerned." She added: "While James was in the MRI room, Mahe waited with me and was a huge comfort as I was a bit shaky after seeing James put to sleep. Mahe and I rejoined James in recovery, where Mahe jumped on the bed and laid with him so he’d be there when he woke." Mahe has not only changed James' life, but the whole family's as well, Isaac said. "Before getting Mahe, our family had become somewhat isolated as going out had become too hard," she said. "James didn’t want to hold our hand all the time or be restrained, and it made outings even more stressful and anxiety-provoking for him and us." Now, James is tethered with a belt to Mahe's jacket, giving him "far more freedom to explore his environment safely," Isaac said. "We found James enjoys outings so much more and as a family we’re able to get back into our community." She added that the dog has "had such an impact on the way strangers look at James," explaining that "before we had Mahe, it was hard. People would stare and you could tell they’d be thinking, 'What's wrong with that kid?' because his behavior was so unusual." Though the family still gets stares now, "it's totally different," Isaac said. "People will now approach us and say, 'Oh, what a great dog, and what does he do for James?' They are interested in James in a very positive way." Michelle said she is so grateful for Assistance Dogs New Zealand (ADNZ), the organization that trained Mahe as a puppy to be able to specifically tend to James' needs. A spokesperson for ADNZ told ABC News today they were very happy James' and Mahe's story "has touched peoples hearts," and they hoped the story would "bring more awareness" to the daily struggles of families with a member who is on the autism spectrum and to "the great assistance that a suitably trained and appropriate dog can give to the individual and the family."